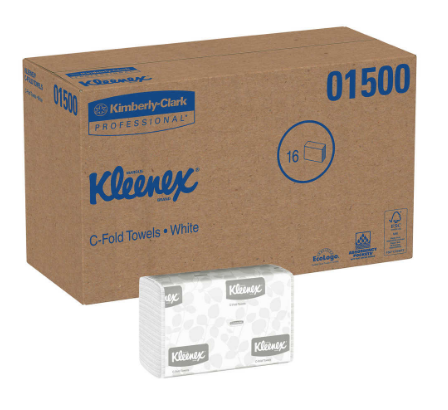 Kimberly-Clark Kleenex C-Fold Towels are premium grade paper towels contained in an eco pack to work with Cfold dispensers used in commercial buildings and businesses. The paper towels have a trifold design allowing the paper towels to stack and unfold nicely when pulled from the dispenser. When unfolded it measures 10.125 x 13.15 inches. This every-day product is highly absorbent and economical so less product is used per individual. The single-ply paper towel has built-in absorbency pockets to quickly soak up water so that one paper towel is all that's needed. Kimberly-Clark 01500 Kleenex C-Fold Paper Towels are also eco-friendly. The white paper towels are from recycled material using 50 recycled fiber content. 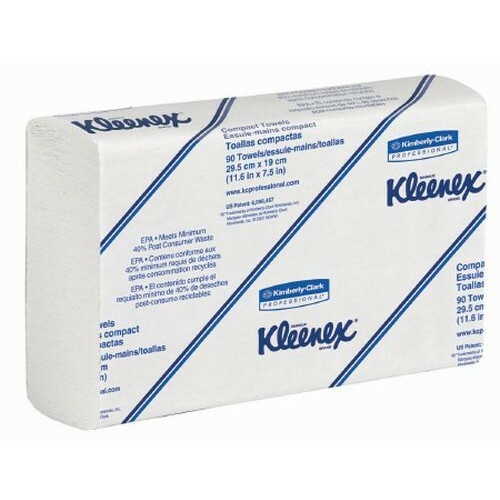 When wanting an environmentally eco-conscious product Kleenex C-Fold Paper Towels is the perfect go-to choice. Make sure to stock up purchasing the case option so you never run out. A single eco pack comes with 150 sheets and the case comes with 16 packs for 2400 sheets. Kleenex is a trusted brand. You may want to check out other professional products manufactured by Kimberly Clark such as Scott Paper Towels in C-Fold, Single-Fold and Multi-Fold in brown and white with 60 percent recycled fiber content.